Two styles of receiver bushings are available. Generally, the face mount receiver bushing is utilized in blind hole applications (Slip Fit). The back mount receiver bushing is used in through hole applications (Light Press Fit). Note: Installed bushings should be approximately .012" below subplate surface. See reference below for installation of back mount style bushings. 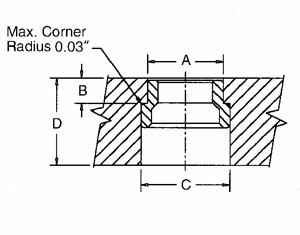 Note on Installation of Back Mount Style: To alleviate the possibility of binding the shank in the bore, the maximum interference fit between bore and bushing O.D. should not exceed .0005".